GrandPR, the Grand Valley State University (GVSU) student-run public relations firm, was selected as one of only four student-run PR firms in the nation by the Public Relations Student Society of America (PRSSA) to host a CreateAthon marathon. Applications to host CreateAthon marathons are very competitive and have more than doubled in the program's second year with PRSSA. "We are truly so honored and excited to partner with PRSSA and CreateAthon to create campaigns for five local nonprofits," says Sabrina Antcliff, GrandPR's current CEO. "We believe that giving back impacts more than just the organization we're serving; it also empowers and motivates our staff and, as the campaigns are implemented, the community. Leading by example, we want to instill a mindset of service before our staff go beyond GVSU and into the workforce." CreateAthon is a 24-hour marathon to develop communications campaigns for nonprofit organizations. GrandPR's CreateAthon will be held on Friday, March 23 from 7pm to Saturday, March 24 at 7pm. GrandPR will work with Grand Rapids Public Library, Friends of Grand Rapids Parks, HQGR, Grand Rapids Community Foundation and Kids' Food Basket to develop campaigns utilizing integrated marketing techniques, public relations strategies, creative digital and broadcast tangibles, and more. "The CreateAthon is a great example of how universities can join with community partners to provide a high-impact learning experience for students while also benefiting local nonprofit organizations and the constituents they serve. GVSU is proud to be a CreateAthon host, and we look forward to seeing the excellent, student-produced work that results from it," Jonathan Hodge, PhD, GVSU School of Communications Director. CreateAthon was founded in 1998 by Riggs Partners, a marketing consultancy in Columbia, South Carolina. It has grown from a single-market event to a 501(c)(3) organization that has attracted more than 100 marketing and communications firms, universities, corporations and professional clubs as official CreateAthon partners. Cumulatively, CreateAthon has helped more than 1,500 nonprofit organizations in the United States, Canada and the United Kingdom by delivering pro bono marketing projects valued at more than $24 million. "This opportunity is really special as the bid involved a series of complex criteria that had to be satisfied in order to even get into this rigorous application process. Our unique relationships with our parent chapter West Michigan Public Relations Society of America (WMPRSA), local firms like 8ThirtyFour Integrated Communications and access to resources here at GVSU put us ahead in the evaluation of applicants. We have a very diverse and talented firm, we are looking forward to creatively solving tough problems that plague our area nonprofits so they can get back to satisfying their missions," Adrienne Wallace, GVSU Faculty Advisor GVPRSSA & GrandPR. Nationally Affiliated firms are the premiere firms of PRSSA. Though there are more than 100 Student-run Firms around the country operated by PRSSA Chapters, only those operating at the highest level are Nationally Affiliated. GrandPR has successfully gone through an application process and demonstrated high marks against the rigorous demands that ensure the firm is strong in three areas: PRSSA/PRSA connection, a high level of professionalism and an effective structure. Meeting these qualifications marks GrandPR as one of 23 Nationally Affiliated firms. In 2016, GrandPR won Campaign of the Year at the PRSSA National Conference in Indianapolis, and had a Gold Key recipient, marking the two highest honors bestowed upon student-run firms nationally. Sponsors for CreateAthon at the time of this release include: 8ThirtyFour Integrated Communications, SaboPR, Mighty in the Midwest, Boxboom Creative, GVSU School of Communications, and BlackTruck Media & Marketing. GrandPR is a nationally affiliated, student-run public relations firm created and managed by student professionals attending Grand Valley State University. The staff is made up of over 30 student professionals, bringing together previous internship, educational, and personal experiences to produce quality work for clients. GrandPR's 2017-2018 CEO is Sabrina Antcliff; faculty advisor is Adrienne Wallace, GVSU School of Communications, assistant professor; and their Professional Advisor is Derek DeVries, Lambert Edwards & Associates, digital strategist. 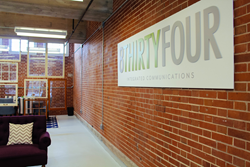 8THIRTYFOUR Integrated Communications is an award-winning firm headquartered in Grand Rapids, Mich., specializing in creating, executing, and measuring holistic communications plans that create lasting results. 8THIRTYFOUR was founded on creating a communications firm that companies need: a creative, hard-working, one-stop shop that doesn't just create strategies, but also implements and measures them.